When you think of open air funeral pyres, you inevitably connect them to Eastern countries such as India, where it’s common for families to cremate their dead in the open air. But one small picturesque Colorado mountain town has followed suit – and houses the only legal, public open air cremation facility in the United States. The town of Crestone is home to the End-of-Life Project which opened in 2007. Since then it has performed more than 60 personalised rituals. The End-of-Life Project say some people prefer a more natural and ecological alternative to the modern day funeral and opt for the open air funeral pyre. The project, which assists with the open air arrangements, is a volunteer group which helps families by coordinating the cremation service at the foot of the Sangre De Cristo mountain range which many see as the perfect place for a natural end to life. Each cremation costs around $500 and this is used as a donation to cover the cost of the wood, fire department presence, stretcher and the use of the land. It also pays for permits and enables the group to offer grief counselling, repose the deceased prior to the cremation and prepare the kindling for the funeral pyre. The service is only offered to the local community, prompting some people to relocate to the area and buy land in order to qualify for the open air cremation facility. This decision was made out of respect for local residents who did not want their community flooded with outsiders wanting ‘novel’ cremations. The project, which will organise a funeral pyre for anyone in the vicinity, regardless of their religion, is also only geared up to handle a limited number of ceremonies per year. The pyre itself is made from a concrete and brick-lined hearth topped with a steel grate. The body of the deceased is usually wrapped in a simple linen cloth and surrounded by juniper logs and branches. Sometimes families wish to light the funeral pyre themselves – this is a ritual that is significant in some religions. It takes about four to five hours for a body to burn completely. Because there is no way to separate the human ashes from the wood ash, the family receives around five gallons of ashes. The type of ceremony at the funeral pyre also depends on the wishes of the family of the deceased. They can opt for anything from a simple service to a more elaborate ritual with eulogies, music and singing. Open air cremation is widely practised amongst Buddhist and Hindu religions, but is still considered taboo in the United States. 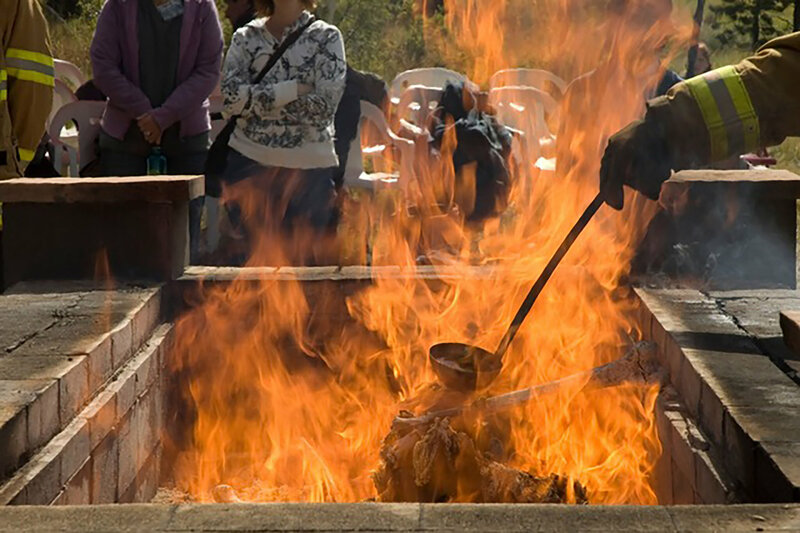 The tradition of open air cremation dates back to references in the Christian and Hebrew Bibles that likens the rising smoke from the pyre to the ascent of the soul to the afterlife.